Looks like LIME doesn't work with Extended Anderson Conversation. Damn good otherwise, the movies are great. It was a tough call on what to do with Anderson and TIM and logistics. I'd prefer TIM dead on Cronos and then Anderson still dying at the end. Yup, plasmaFLOW did a great job. But Anderson still dies at the end of the EAC ? It would fit perfectly well in LIME imo. That part of the ending felt a bit abrupt without more content. JAM is generally the recommended one by people who voice their opinion. I think MEHEM still gets a huge amount of downloads now. JAM vA, if you can be fine chatting with starkid, is really well done and close to vanilla but has the conversation and outcomes work out a little nicer I think. LIME is not perfect by any means. I "like it" but there's always something I would want to do differently if I could. But at this point I seem to be very retired from modding. Thank for your work, Deager. It looks amazing. I'm also trying to choose between both, and now I'm even more confused, no thanks to you. Guess I'll go with LIME this time. Thank you for your work, Deager! I honestly have no idea why I haven't tried this mod earlier, but now after checking the videos I'm downloading the "Cycle Continues" version. Even in its linearity, it will make the endgame more satisfying than the original three-colored mess ever could. I have a question, though. Does the Crucible docking scene always play the same with the "Cycle Continues" version of the mod? I like to lead the fleets to Earth with low EMS, to see them absolutely decimated by the Reapers. With your mod, these low-EMS cutscenes should crank up the hopelessness of the fight even more. Good question. I don't remember how I set that up. I "think" I have the low-EMS cutscenes set by default but I admittedly don't remember. While I find the Cycle Continues emotionally gutting, logically, it's my favorite ending. perfect ending, totally what happened nothing else :) thank you! Thanks for the note. I'm glad you liked it. does the WWP version have something like the citadel dlc epilogue mod? Thanks. If you go to the CEM site you'll see that I made a transition from LIME-WWP to CEM. My biggest problem with the slides was a technical problem. I messed around with so many conditionals that I can't get them to play properly when I try. Odds are still no new version but I tend to avoid saying "never." I didn't do anything which should affect those initial slides when the tube thingy is being shot; so whatever mechanism the game uses to determine those should still be active. For the Hackett speech and all that good stuff; I don't have plans to do that. Apparently something in how I made part of LIME work effectively breaks the epilogue slides. That said, if, and it's a big if, I would mess with this again, that is the option I would consider doing. In fact, I've tinkered with an idea that's almost exactly JAM but EDI instead of the Catalyst; having the TIM conversation added back in which would then allow the Anderson conversation. But it's not likely that I would mod anymore so just be aware of that. I'm guessing you're using CEM as well as LIME here, correct? Any chance you have maybe installed another ending mod by accident (don't laugh, I've actually had people do that.) Or, any other mods installed, particularly since your clean build? Any coalesced edits you're doing? Textures? I'm just asking for a ton of info and hopefully we can figure this out. Massive respect to you and plasmaflow for the new cutscene. You've essentially fixed the last plot hole. So how did Joker gets the Normandy to Earth? Mass Effect corridor. 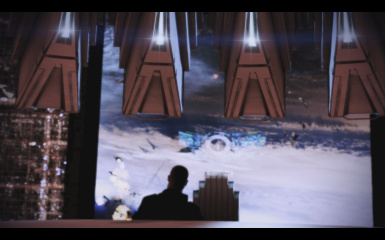 Also sorry to ask again, is there still a chance for a Shepard survives ending where the ground team dies? plasmaFLOW did great work on those videos. I don't think I'll have the ground team die in the We Will Prevail version. I agree that it makes more sense by a ton. But the breath scene will get messy with conditionals on "who's dead and who isn't." I absolutely love this mod (especially the victorious one) but I gotta admit I also like the extended conversation with Anderson mod, is there any way I could have both, like would you happen to know a solution? Thanks for the kind words. At this time there's no way to get that to work. Cutting that conversation in general was a tough choice, and I sometimes miss it too.